October — 2016 — St. Finbarr's A.C. 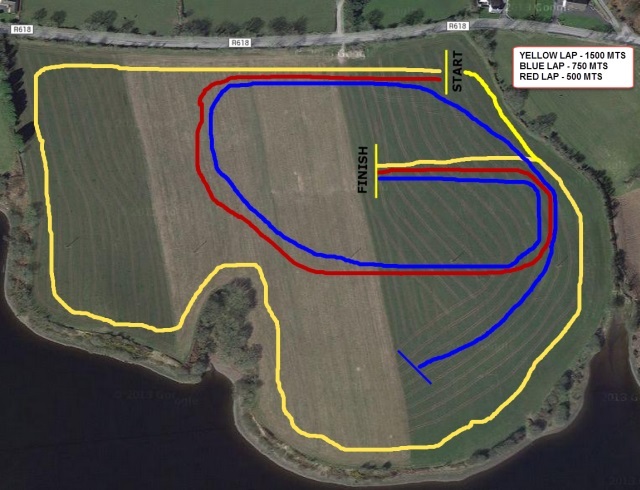 The Munster Juvenile Even Age, Novice & U/23 Cross Country Championships 2016 will be held in the Ballinahina area commencing at 11.30am on Sunday 23rd October. The three main routes to the venue will be signposted from Dunnes Stores Ballyvolane, the bottom of Dublin Hill and Carraignavar village. The venue is NOT the same as that of the recent County Novice XC; from Cork City, it’s about 3 miles short of Carrignavar. There are 12 races on the cards for Sunday starting off with the Juveniles at 11.30am. The Novice Women and the Novice Men are the last events on the program so allow plenty of time for slippage either way! There’s plenty of parking inside the field – no parking on the main road! The Munster Novice XC is held under AAI rules; participating athletes must be registered club members and wear a club Singlet. Transport will be available leaving the UCC Farm, Curraheen at 12:15pm. We wish the very best of luck to all our participating club members. The second weekend of the new season features the County Senior XC, the premier event on the local calendar. Cork clubs will be vying to get their hands on the coveted team and individual titles. The venue is Carrigadrohid, 8km city side (east) of Macroom, on the R618, Macroom-Coachford road. The event is hosted by West Muskerry A.C. and gets under way with the Senior Women at 12pm followed immediately thereafter by the Senior Men. Events conclude with the Junior and Juvenile Uneven Age races. The County Senior XC is held under AAI rules; participating athletes must be registered club members and wear a club Singlet. Transport will be available leaving the UCC Farm, Curraheen at 10am. We wish the very best of luck to all our participating club members. 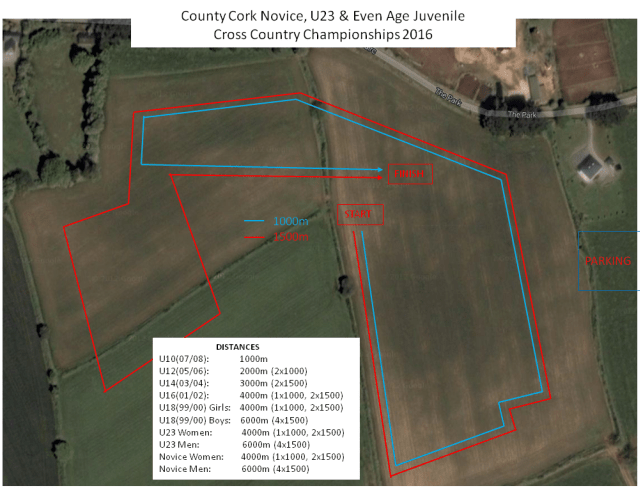 The Cork AAI Novice & U23 XC takes place on Sunday 02-Oct-2016 from 12pm. The venue is Aghern, Conna, Co. Cork. This venue is NOT the Hayes’ farm that members will be familiar with from previous years. The event is organised and hosted by St Catherine’s A.C. and gets under way with the Novice Women at 12pm followed immediately thereafter by the Novice Men. From the Dunkettle roundabout, take the M8 for Dublin. To avoid tolls, exit the Motorway at Exit 17, Watergrasshill. Go through the village and head north for Rathcormac on the R639. 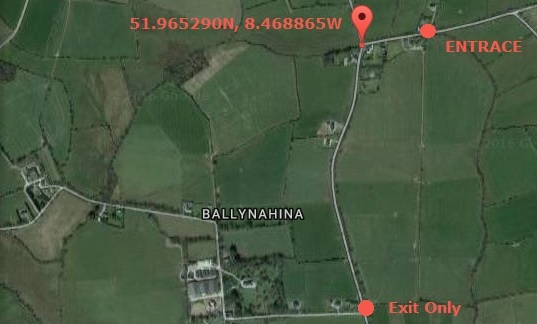 About 0.5M before Rathcormac, turn right onto the R626. Shortly after, take the first left onto the R628. From here it’s about 5.5M to the crossroads at Aghern. Turn right at the Big Tree pub and the venue is 0.75M up hill on the right.